Landfill caps have a long history of providing successful solutions to the waste management industry. Landfill caps are primarily used to reduce or eliminate the infiltration or precipitation into the waste and thus minimizing leachate generation. Caps are also used as part of a gas management system to capture and safely vent or harvest methane upon landfill cell closure. We have participated in some of the largest capping projects and have developed geomembranes specifically designed for this application.Generally there are two types of impermeable landfill caps; temporary and permanent. Permanent caps are normally placed over a leveling course of sand then overlain by a drainage layer, topsoil, and vegetation. They may also incorporate a gas collection system beneath the liner. Permanent geomembrane caps are subjected to a great deal of strain in all directions due to differential settlement and occasional gas pressure buildup from beneath. Caps are often placed on sloped areas and expected to hold a veneer of other geosynthetics and soil above them over a long period of time. Occasionally, permanent caps are left exposed, thus requiring sophisticated wind uplift ballasting systems and high levels of UV stability. Our Enviro Liner® 6000HD is purpose-built for this application with unmatched ability in a polyolefin-based material to stretch in any direction without yield. EL6000HD is also fortified with an advanced UV/AO package that allows us to provide the longest weathering warranty in the industry. 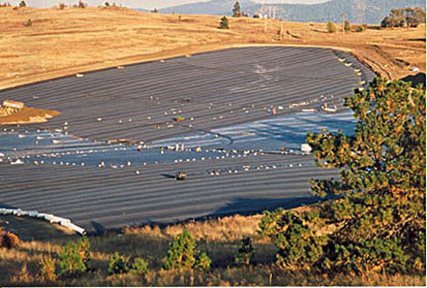 For permanent landfill caps that are backfilled, Enviro Liner® 4000 is a good choice of material. For exposed interim landfill caps that need to last for over 15 years, Enviro Liner® 6000HD is the material of choice. Both the EL4000 and the 6000HD are available with a textured surface on one or both sides.